Frank Norris gathers ’round the pit. As the interest in the immediate situation declined, the crowd in the trading pit grew less dense. Portions of it were deserted; even Grossmann, discouraged, retired to a bench under the visitors’ gallery. A little later a certain broker came scurrying across the floor from the direction of the telephone room. Panting, he flung himself up the steps of the pit, forced his way among the traders with vigorous workings of his elbows, and shouted a bid. But the victim, good-natured, readjusted his battered hat, and again repeated his bid. “Ah, go to bed,” protested Hirsch. The incident appeared to be the inspiration for a new “josh” that had a great success, and a group of traders organized themselves into an “anti-cravat committee” and made the rounds of the pit, twitching the carefully tied scarves of the unwary out of place. Grossmann, indignant at “t’ose monkey-doodle pizeness,” withdrew from the center of the pit. But while he stood in front of Leaycraft, his back turned, muttering his disgust, the latter, while carrying on a grave conversation with his neighbor, carefully stuck a file of paper javelins all around the Jew’s hatband, and then—still without mirth and still continuing to talk—set them on fire. 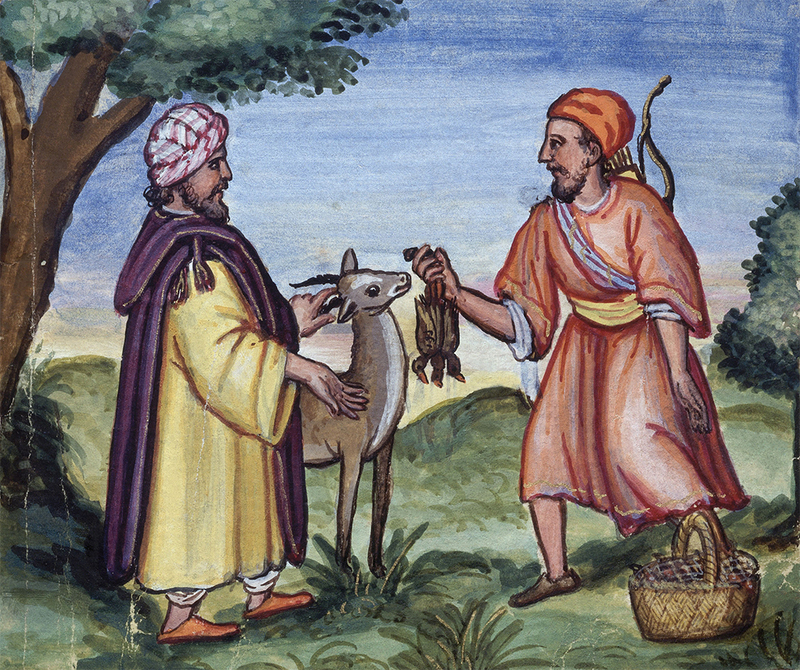 Meeting between a merchant and a hunter, miniature from a sixteenth-century edition of The Just Prince by Ibn Zafar. © Album / Art Resource, NY. Landry imagined by now that ninety-four and an eighth was as high a figure as he could reasonably expect that morning and so began to “work off” his selling orders. Little by little he sold the wheat “short,” till all but one large lot was gone. Then all at once, and for no discoverable immediate reason, wheat, amid an explosion of shouts and vociferations, jumped to ninety-four and a quarter and, before the pit could take breath, had advanced another eighth, broken to one-quarter, then jumped to the five-eighths mark. It was the report on the visible supply beyond question, and though it had not yet been posted, this sudden flurry was a sign that it was not only near at hand but would be bullish. A few moments later, it was bulletined in the gallery beneath the dial and proved a tremendous surprise to nearly every man upon the floor. No one had imagined the supply was so ample, so all-sufficient to meet the demand. Promptly the pit responded. Wheat began to pour in heavily. Hirsch, Kelly, Grossmann, Leaycraft, the stolid Winston, and the excitable Rusbridge were hard at it. The price began to give. Suddenly it broke sharply. The hand on the great dial dropped to ninety-three and seven-eighths. It was the last one of his unaccountable selling orders of the early morning. Suddenly some instinct warned Landry that another break was coming. It was in the very air around him. He could almost physically feel the pressure of renewed avalanches of wheat crowding down the price. Desperate, he grabbed Paterson by the shoulder. We are a commercial people. We cannot boast of our arts, our crafts, our cultivation; our boast is in the wealth we produce. “Take it,” vociferated the other, as though answering a challenge. And in the heart of this confusion, in this downward rush of the price, Luck, the golden goddess, passed with the flirt and flash of glittering wings, and hardly before the ticker in Gretry’s office had signaled the decline, the memorandum of the trade was down upon Landry’s card and Curtis Jadwin stood pledged to deliver, before noon on the last day of May, one million bushels of wheat into the hands of the representatives of the great bulls of the Board of Trade. Nobody listened. The traders stood around in expectant attitudes, looking into one another’s faces, waiting for what they could not exactly say; loath to leave the pit lest something should “turn up” the moment their backs were turned. By degrees the clamor died away, ceased, began again irregularly, then abruptly stilled. Here and there a bid was called, an offer made, like the intermittent crack of small arms after the stopping of the cannonade. From The Pit. Published in 1903 as the second part of Norris’ epic trilogy about wheat, this naturalist novel describes the lives of speculators in Chicago’s Board of Trade. Established in 1848, the CBOT offered forward contracts to buy and sell grain on a trading floor known as a pit. Through a process referred to as “open outcry”—in which traders shouted their orders—exchange members bought and sold for their own accounts or on behalf of clients. In 2015 the exchange closed most of its pits and replaced them with online trading systems.